Over the past week, Club Doncaster Foundation joined over 1,700 community groups around the country in taking part in Alcohol Awareness Week. Throughout this time, which saw more than double the number of groups that took part last year, the Foundation took the time to look back and reflect on those it has helped in overcoming alcohol-related issues. The health and wellbeing programme offered by the Foundation, Fit Rovers, has allowed more than 250 men to improve their fitness and make a positive change to their lifestyle. The programme tackles awareness of diabetes, dieting and, most notably, alcohol consumption, to which one member of the most recent Fit Rovers course has benefitted from drastically. 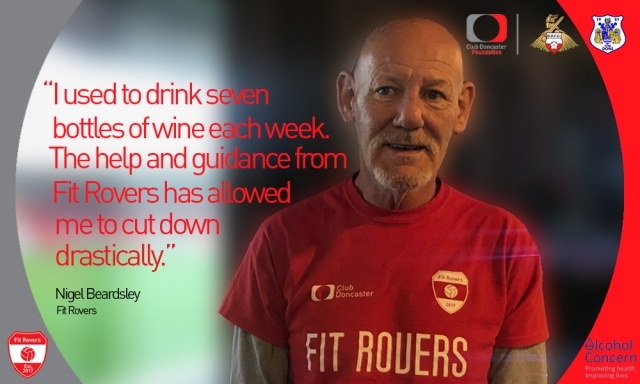 Nigel Beardsley, 59, began the Fit Rovers programme at the start of October this year, and has gone onto make big improvements to his lifestyle, including educating himself on monitoring his alcohol consumption. Nigel admits he is a fan of red wine, and whilst Fit Rovers has not discouraged him from cutting out drink altogether, it has opened up his eyes to effectively managing his alcohol intake. He even goes as far to admit his drinking habit became a “joke” amongst his friends and family. Without going as far to say he was an alcoholic, Nigel did acknowledge how he had slipped into a drinking habit that would be difficult to break: “During the week I’d have the odd glass of wine, but then that odd glass of wine became a couple of glasses of wine”, he told Club Doncaster Foundation. “I do a lot of cooking, so I would crack open a bottle of wine and pour myself a glass whilst I was cooking. By the time I had finished cooking and the meal was ready, I’d pour myself another glass to have with the meal. Then when I was tidying up, I’d notice the last bit remaining in the bottle and think to myself ‘I may as well have that’, so I’d pour that last glass. Since joining Fit Rovers, Nigel has made a huge improvement to his lifestyle, which has led to a decrease in alcohol consumption, improved self-confidence and general health. He went onto add: “My wife was going on at me, saying that I need to break this cycle. “I haven’t stopped having a drink, but whereas before I was buying seven bottles of wine a week, since I started Fit Rovers, I’ve been buying one or two every few weeks. “Those two bottles or so will last me at least two weeks. There are nights where I don’t have an alcoholic drink at all. A year or so ago, that would have been really hard to do. I’ll have a drink if I fancy it, before I’d have a drink if I fancied it or not. Every year, thousands of lives are lost and hundreds of thousands damaged as a result of alcohol. This has increased the number of partnerships Alcohol Change UK, the charity who spearheads the week, allowing more people to be treated. Local authorities, workplaces, GP surgeries, pharmacies, hospitals, charities and other community groups are coming together and organising events to tackle alcohol abuse. For more information on how Fit Rovers may be able to help you, please get in touch on 01302 764663 or alternatively at fitrovers@clubdoncasterfoundation.co.uk.